New York Fashion Week (NYFW) for the FW19 season in February 2019. The first time I heard the term Global Fashion Collective (GFC), I really had no idea what it was. However, it seemed to be helping relatively unknown fashion designers by taking their collections and showcasing them on the world stage in Vancouver Fashion Week, New York Fashion Week and Amazon Fashion Week Tokyo. I believe London Fashion Week is the next in their sights. What an amazing opportunity. With GFC's next series of fashion shows due to hit the stage in New York, it was time to learn a little more. It launched in 2017 and is an expansion of Vancouver Fashion Week. Their goal is to support and promote the work of emerging designers by showcasing their work in exclusive runway shows in fashion capitals around the world. They work"...alongside PR agencies in the respective fashion capitals on top of our own social media outreach and editorial platforms, to gain maximum exposure.."
As their NYC shows are starting soon, I thought it would be interesting to take a look at the amazing talent they are promoting including two from locals whose work I adore - Kirsten Ley and M.E by Michelle Elizabeth Lee. If you're in NYC right now, I have information on how you can attend at the bottom. Below is the schedule and the location for each day. FAUN Studio was created in early 2018 by Canadian fashion designer, Marisa P. Clark. This up-and-coming contemporary women swear line is known for its whimsical and feminine pieces; timeless and charming, yet playful and bold! Seen on the runways in Vancouver, LA and Paris Fashion Weeks, this is her first debut at New York Fashion Week. 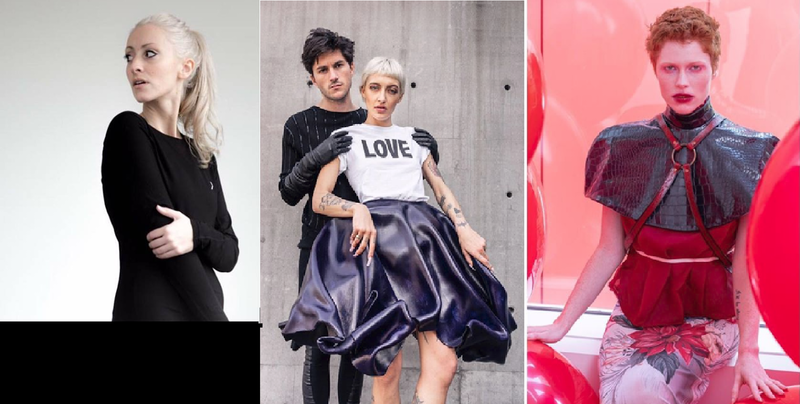 This collection will showcase new pieces from FAUN’s Autumn/Winter 2019-2020 ready-to-wear capsule. From personal loss, Marisa channeled her grief into her creativity; moving into fashion and launching her own line. Marisa believes in building personal relationships between everyone she works with from the fabric suppliers and production team to the boutiques that carry her collections across Canada. Kirsten Ley is an award-winning Canadian couture designer who has recently launched a prêt-à-porter line. Using intuitive and sculptural techniques, she creates visceral one-of-a-kind works of art, juxtaposing structurally bound garments with the softness and translucence of fervent, flowing silks. Gifted with both a technician’s hand for tailoring and the unhindered inventiveness of her artistic expression, Ley’s signature aesthetic is laden with fabric manipulation as she playfully challenges her viewers' perception. Her empowering garments balance strong lines and hard tailoring with soft femininity, immense attention to detail, and free flowing creativity of reckless abandon. Kirsten Ley is rapidly making her mark as an innovative, experimental, and tactile designer on the world of fashion. NiuNiu Chou, of ERXI X MRHUA MRSHUA, uses Pop Art as an approach to cross borders with fashion. He creates with digital printing and embroidery to showcase the beauty of the East. He focuses on emotions, the five senses, and strives to create trends with his avant-garde fashion. Based in China, NiuNiu Chou has showcased his clever collections at Arab Fashion Week, Tokyo Fashion week, Vancouver Fashion Week, and New York Fashion Week. He combines art and fashion to create innovative collections such as his latest works ‘Green Fairy Tales’, and ‘Retro Sentinel’. Michelle Elizabeth Lee is from the gulf islands of British Columbia, Canada. She leads a life focused on the process of creation and self-expression. 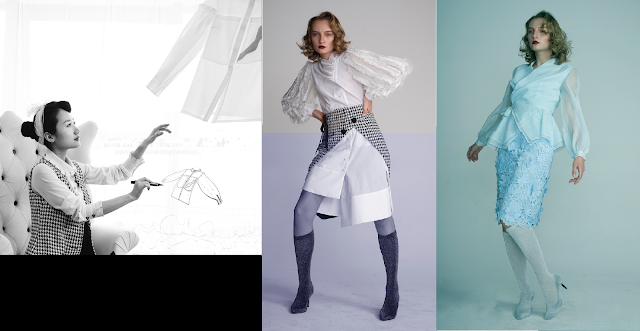 Graduating from the Helen Lefeaux School of Fashion, and teaching at Blanche Macdonald centre for Applied Design lead to the creation of the boutique sample house Kloth. Mentoring under a master pattern maker and working with greatly skilled individuals has enhanced her ability to render concepts into reality. With a focused attention on personal desires, designing and creating… this evolution has produced M.E. Creative Director, Bomin Kim With a love for all the beauty in the world like beautiful houses, goods, and people, Bomin Kim believes that all the beauty of fashion can be achieved through the happiness of the wearer. In her pursuit of eternal values, she has run her poetic and romantic label "CANEZOU" for over 15 years and is now creative director for various brands, Queenie Zoe for instance in Korea and China, at present. Based in China’s historic city of Xi’an, HIGHTLI is a post-modernism and new vintage fashion brand since 2013 and a participant for Shanghai Fashion Week. Tong Li, the chief designer and founder of the brand has previously fused various European art forms, such as Rococo, into the design of staff suit for in Xi’an’s modern theatre, music hall and Mercedes Benz. SUNCUN, established in 2015, is a fashion brand committed to producing innovative designs, providing artisan tailoring and offering excellent pattern making. The company is a leader in Chinese clothing, and its team of fashion designers consists of experienced and highly-skilled professionals in the industry. Dedicated to safeguarding intangible cultural heritage, SUNCUN has been popularizing Cheongsam Fashion, promoting China’s traditional culture, and advocating the beauty of oriental fashion. This season they are branching out into children swear as an addition to their adult line. To keep updated follow our instagram @globalfashioncollective.